Koichi Tohei Sensei, Founder and President of the Ki no Kenkyukai (the Ki Society International), visited the United States this past August for the first time in 12 years. During that visit in Kahului, Maui, on August 7, 1993 he granted Aikido Today Magazine this interview. Tohei Sensei was the Director and Chief Instructor of Aikikai Hombu Dojo for O-Sensei for many years. In 1953, having been told by O-Sensei to introduce Aikido to America, he came to Hawaii at the invitation of the Nishikai, a health-oriented organization. 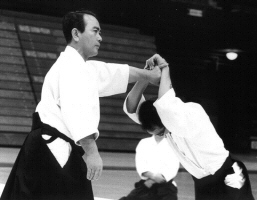 Subsequently, Tohei Sensei was instrumental in spreading Aikido around the world, traveling 28 times between 1953 and 1982 to America, Europe, and the Pacific. In 1969, he was promoted to 10th dan. 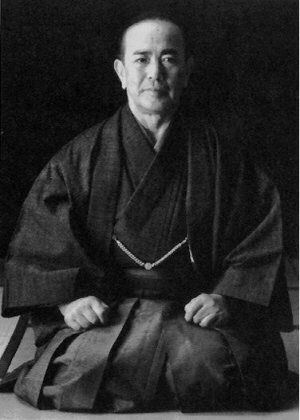 Previous to his study of Aikido, Tohei Sensei had studied Zen and Misogi. He began study with O-Sensei in 1939, but then was sent to China during World War II as commander of a combat unit. Remarkably, all 60 soldiers under his command survived three years of combat. Returning to Japan in 1946, he continued his studies in Zen, Misogi, and Aikido and he began Mind-Body Unification Training with Tempu Nakamura. From his studies and experience, Tohei Sensei developed new insights and teaching methods. He established the Ki Society to teach Ki development in 1971. 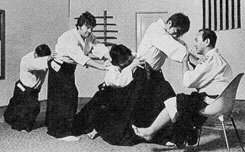 In 1974 he separated from the Aikikai so that he could continue his teaching of Ki development. Since 1975, the Ki Society has also taught Aikido with Mind and Body Unified (Shin Shin Toitsu Aikido).To fulfill Tohei Sensei's dream of spreading Ki training beyond the Aikido community, The Ki Society recently built a world headquarters and dojo complex, Ki no Sato, in Tochigi Prefecture, Japan. Throughout the years, Tohei Sensei has maintained his focus on promulgating the study and practice of the four basic principles of Ki: 1. Keep one point. 2. Relax completely. 3. Keep weight underside. 4. Extend Ki. Sensei, you were the person who first brought Aikido to America 40 years ago. What do you think of America now? In Maui, everything is completely different. When I came here the first time, everything was sugar cane and pineapple fields - very few houses. Tell us about the first people who you taught here. In Japan, I practiced only with small-sized people and only one-on-one. But, when I came here, I was often attacked by 5 or 8 people at once, all big men. The first time I didn't have any confidence because I had no experience. But then I remembered about mind over matter - that someone with a big body doesn't necessarily have a big mind. Because I knew how to control my own mind, big or small didn't matter. Did your experiences here In Hawaii affect the way you taught Aikido and Ki development? At first, I wanted to teach Aikido. But "Aikido" means "combining with the Ki of the universe" - that is the meaning of the term. So before I taught Aikido arts, I taught how to use Ki - that is, how to control one's mind and body. Then I taught Aikido. Many times, after people master Aikido arts, they forget the Ki principles because they cannot see the mind. Mind has no shape, no color - so it's easy to forget. But, in the Ki Society, we teach that if you don't practice the Ki material, you don't really know how to control the mind and body. Now, I never teach Aikido by itself. Here in Maui and elsewhere, members of the Ki Society practice the Ki principles first, then they learn Aikido. Without Ki, Aikido is nothing; none of its arts work. Most of us rarely need to apply physical Aikido arts in daily life. But we apply control of our minds and bodies throughout our whole lives. That is why I mainly teach Ki principles. Since you were first here in early fifties, have you seen changes in the kinds of students who study Ki and Aikido? Some people have changed; some people haven't. Mr Suzuki and Mr. Tabata - they were some of the first people to study Ki principles, and after 40 years they still continue to study them. But many other people quit. If one only learns Aikido technique, when one becomes old, one cannot use them. But Ki principles can be applied to daily life for one's whole life. And, for one who knows these principles, Aikido technique never deteriorates. In America many people are big and strong, and so they may not have learned about Ki. I am now 73 years old, I am a small man, and I don't exercise to keep up my physical strength. But I can still throw. Didn't you once train a Sumo champion? Yes. Chiyonofuji was my student. He was a small man for Sumo -about 250 pounds. But he has a tremendous physique, and his Ki training helped him keep his rank for many years despite his size. What do you expect in the future for Aikido and Ki training? Sometimes I teach Aikido, but mostly I teach the principles of Ki. I am spreading these principles to young people. Now I also teach Kiatsu - using the power of Ki to heal. Everybody has this power, not just a few. But many people don't know that they have it. So, I must let them know. I think each house needs someone with Kiatsu training, so that the people in the household don't need to go to the doctor or the hospital as often. A bad shoulder, bad hip, or bad kidney - these one can fix by one's self. Is Kiatsu your direction for the future? For this evening's celebration, 30 people came from Japan. Half of them are very sick; their doctors said they shouldn't go out, but they came here. One lady had such severe pain in her bones that, for 27 years, she couldn't sleep well. But I did Kiatsu on her and she now has no more pain. Before she couldn't get out the door; now she is in Hawaii! Many young, healthy people come to practice because they find Aikido appealing, particularly when they see Aikido with Ki. They say "Ah, this is It!" and then they discover the power of Ki. That's right. Younger people don't have much trouble with their health. They ought to learn Aikido. But, while I teach Aikido I also teach the principles of Ki. If they know and use these principles, people don't have to become sick when they become old. When people get sick, it is too late. Before one becomes sick, one must realize the importance of living the Ki principles. Sensei, if the young aren't concerned about their health, they're not going to understand the importance of learning the principles of Ki. How can we introduce them to these principles? Everyone has to coordinate mind and body. The power of Ki is like an iceberg: we can see only a small part of it, since most of it is hidden beneath the surface. Everyone has all of this power, but most people notice only the "tip of the iceberg" and say, "My power, my power!" We must teach people that everyone has a strong, living power and that those who understand this power don't have to be sick. When people are young, they can practice Aikido to develop this power. Sensei, how has your headquarters complex (Ki no Sato) grown, and how do you see it growing from here? I built Ki no Sato in the countryside. So, even in Japan, many people didn't know about it. But now many companies have found out about it. Corporations are starting to have seminars at Ki no Sato. If American students of Ki and Aikido want to come to Ki no Sato, are there any programs for them? Small groups can make special arrangements. Also, we are planning to hold world camps, and people will be able to come from abroad for them. At these world camps, I myself will do most of the teaching. Sensei, It seems that in popular films people show the more dramatic elements of Aikido arts and that we are getting farther and farther away from ideas of Ki development. Films just show fighting. I do not teach fighting. When Karate was popular, every one studied Karate. But they expressed fighting - the fighting, competitive mind. Many problems resulted - people getting sued and such things. Any martial art that is based on fighting is bad for society. Martial arts mostly teach how to control others. But one has to control oneself, not others. I teach how to control one's own mind and body. Many people are easily excited. They loose themselves, especially in combat. Even good men kill - it's crazy, and I don't like it but, often, people who practice martial arts - arts of fighting - become like that and fail to keep calm. That is what is most important. The important thing is to control oneself. Many people can defeat others but cannot control themselves. We must teach Ki principles to both the young and the old - the young so they don't lose their way, and the old so that they can maintain and restore their health and vigor.